Report from Numer 2002 | JONAH BRUCKER-COHEN, PH.D. Report from Numer 2002 – JONAH BRUCKER-COHEN, PH.D.
On a warm, spring April weekend in Paris, the Numer 02 International Conference on Interaction Design (www.numer.org)- “Look Ahead” – opened its proceedings to an international audience. Assembled from around the globe by conference coordinator, Pierre Lavoie, participants ranged from producers to designers to artists to musicians. The goal? Attempt to build a framework for current practices and future directions in interactivity and design using technology. 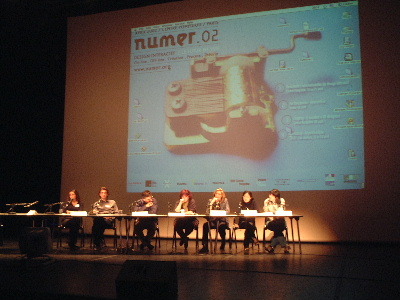 The conference included six design themed panels with over 40 panelists along with a audio/visual music performance at the Insitut de Recherche et Coordination Acoustique/Musique (IRCAM), a “Zapping” showcase featuring 30 local designers flaunting their wares, as well as a design/programming workshop by Ben Fry and Casey Reas – on their new interactive graphics authoring tool, “Proce55ing”. The opening panel, “Process and Adequacy” centered on the creative practices of multimedia teams working on interactive projects and the criteria that makes this work valuable. Canadian designer, Stuart Butterfield, (www.the5k.org), opened the panel with severe jet lag speaking on the poverty of the navigational metaphor for interactive media. His talk focused on the need for context in navigating information spaces and how getting ‘lost’ online is not necessarily a negative experience. Arnaud Mercier, also on the panel and founder of elixirstudio.com posed the questions “Is web design dead?” and “How can we define notions of ‘quality’ pertaining to interactivity?” These might seem like lofty questions for a suspecting crowd, but they simply skimmed the surface of the themes discussed. The evening session on “Interactive Cinema” featured an eclectic mix of pioneers in the field such as Montreal’s Luc Courchesne (www.din.umontreal.ca/courchesne), Michael Naimark (www.naimark.net), stuckontheweb.com’s Chris Hales, and 3D designer, Xavier Boissarie. The questions focused on how the user can play a part not only in the outcome of a narrative but also in creating the narrative itself as it is generated through the interaction process. Hales’ talk, “Why bother with interactive movies?” was a light-hearted romp through the criteria inherent to interactive movies including screen constraints and using the movie itself as interface. He demonstrated these techniques with the hilarious “Messed Up!”, a mouse-based attempt at destroying some poor guy’s apartment by clicking on hotspots that spill wine on the floor and knock over books. Naimark, on the other hand asked the audience a rhetorical question, “How do you know I’m not a movie?” He went on to talk about his past projects and concepts of “Movie- Mapping” spaces along with his current work on “Camera Zapping” or neutralizing cameras by aiming low-power laser pointers at their lenses. Where day one focused on processes of visual interaction, day two included the “Creativity and Formalization” panel which included the relation of audio to interactive visual systems. Jean-Jacques BirgŽ (www.hyptique.com/drame) began the session with his flocking on-screen birds that created musical compositions in relation to the cursor. Sodaplay.com designer, Ed Burton, livened the audience when he demoed his interactive soda constructor applet. 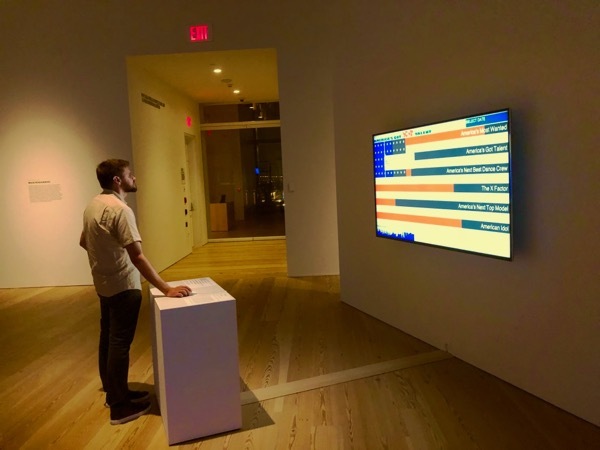 He showed examples of projects people have created with his software – everything from a wild animal in a zoo to a memorial for late racecar driver, Dale Earnhardt. He is soon launching sodarace.net – a space for people to build Sodaplay creatures that race each other. Think virtual Battlebots. Proceeding speakers included Andy Cameron of Italy’s Fabrica Studio who spoke on and showed simple examples of input/output dealing with sound and video interaction. “Keep it simple” seemed to be an ongoing conference theme. This continued with Golan Levin (www.flong.com), MIT Media Lab Aesthetics and Computation graduate, who presented simple interfaces and interactions using dots, lines, planes, pixels, and sound. Levin also performed his much heralded “Audio/Visual Environment Suite” at the IRCAM the previous evening and focused on how sound and image both have to be equally malleable in interactive interfaces. Ben Fry and Casey Reas, also ex-ACG students gave an explanation of their new language/system called proce55ing (www.proce55ing.net) which is similar to John Maeda’s Design By Numbers, and allows designers to learn and think about programming from a visual perspective. Their main concept was that computers provide a unique area of expression and how can simple tools and simple interfaces lead to more complex tools and complex interfaces? Even so, a question asked of them was: How can you teach complexity by hiding it? Maybe Steve Cannon, lead programmer of Netomat.net, answered this best when he opened his talk with a quote from Clement Greenberg that read, “All profoundly original art looks ugly at first.” This could be the case, but this subjective statement really depends on your definition of ugly. He then challenged the audience to come up with an abstract e- commerce experience to fill his domain, abstractstore.com. Closing out the talk was designer/programmer Peter Cho (www.pcho.net), also ex-ACG, who presented some interactive typography experiments. Other panels included “Culture and Critique” which focused on the cultural implications of computer interaction and “Beyond the Screen” which examined the relationship of physical objects (from wearables to tangible interfaces) to networked digital systems. Regine Halter and Dorothee Schiesser (Shoplab) of the Hyperwerk studio (www.hyperwerk.ch) in Basel gave a talk entitled “We like design (but we don’t know if design likes us)” where they detailed interactive projects their students worked on ranging from fabric pattern design created by tracking people in a space to augmented experiences in the retail shopping world. Taking the virtual onto the street was Katherine Moriwaki and Sabine Seymour, both Design Fellows at Parsons School of Design in NYC. They spoke about their collaboration studio in Wearable Technology and Fashion (http://a.parsons.edu/~fashiontech) and presented their focus on fashion and technology as the ultimate “fantasy amplifiers” – focusing on student projects which included a camera-flash necklace called the “Man Repellent” and a t-shirt as dynamic visual display for activist groups. Finishing up the panel was the French duo, ElectronicShadow.com who presented a slick version of hybrid networked spaces with multiple projection screens, a wearable scarf/telephone, and a new interpretation of Internet time as the global “25th time zone”. As the conference came to a close, even more questions arose as to where the future of interaction design is heading. Will faster computers surpass the imagination? Are we in an epic battle between high-tech hyperrealism and lo-tech creativity? Are metaphors of interface too great to overcome? How can we integrate the breath and depth of human experience into human/computer interaction? How far has this debate come and how will it manifest itself in the future? Hopefully that’s a question that will be constantly challenged and questioned over time. Lucky for us, events like Numer 02 exist and continue to honor this dialogue as an integral element of technological theory and implementation both at the individual and social levels.